Foreigners should be in possession of a valid national internal or foreign passport for entry and exit from Russia. - a letter from the travel agency and a copy of MBV confirming the booking of tourist services to secure a tourist visa. - a ticket or a voucher for a ticket with confirmed dates and itinerary of transit travel trough Russia, as well as a letter from the travel agency with MBV confirmation of services provided on arrival and departure, transfer and excursions in the points reserved by the client to secure a transit visa. - a written invitation from an organisation or relatives (friends), located or residing in Russia to get an ordinary visa. The above mentioned documents should be presented in advance to the Russian Consulate in your country in accordance with the rules established by them. 2.1. 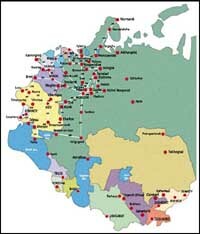 For transit through Russia en route to and from Armenia, Belarus, Georgia, Kazakhstan, Kyrgyzstan, Tadzhikistan and Usbekistan foreigners should be in possession of a valid visa for travel to one of the above mentioned states. 2.2. For transit through Russia en route to and from Lithuania, Latvia, Estonia, Ukraine, Moldova, Azerbaijan, Turkmenistan and other foreign states, foreigners should in possession of a transit visa for both parts of the journey. Such transit visas are issued by the Russian Consulates to travellers possessing a valid visa to the abore mentioned countries, unless no other formalities are observed by inter-state agreements. - travellers stay overnight on board the cruise ship and leave port on board the same ship. 2.4. Visas for entry to the states of the former USSR can be obtained in Consular Offices of the newly independent states abroad or through the embassies of these states in Moscow. More detailed information on visa requirements can be obtained in Consular Offices of Russia abroad. There are 12 times zones in Russia. The difference between Greenwich Mean Time and the time in some Russian cities is: Moscow and St. Petersburg +3. The Russian monetary unit is rouble. There is no limit to the amount of foreign currency allowed to be brought into Russia. All money brought into Russia (including traveler�s checks) must be declared upon entering the country. In Russia tourists can exchange any amount of hard currency for roubles in hotels, international airports and sea ports, at any exchange office of authorized Russian banks. Exchange rates are set by authorized Russian banks within Russia. It is prohibited to take roubles out of Russia. The tariff for postal service and international and local telephone service on the territory of Russia is roubles. Major hotels have post office facilities. Automatic dial telephone service is available in most areas of Russia. Tourists can dial directly from their room phone in the hotel or from special pay phones in the lobby. Metro is the most comfortable and fastest means of public transport within the city. The Moscow metro network has over 140 stations, the total length of lines covering about 215 kilometres. The transport fare for all metro lines in any city is one token. You can purchase a token at the entrance of all metro stations. Buses, trolley buses and trams operate on the ticket system.